Son of Sir Benjamin Hobhouse (a rich brewer) and Charlotte Cam. He met Lord Byron during his studies at Trinity College, Cambridge and together they travelled to the Peninsula, the Balcan and Turkey in 1809. Hobhouse supported Byron after his separation in 1816 and the poet dedicated the fourth canto of his famous "Childe Harold" to him. His sympathy for Napoleon (expressed in his "Letters written by an Englishman During the Last Reigh of Napoleon", 1815) got him into trouble and we can guess his feelings when after Napoleon's first fall he watched the victorious Wellington parade through London at 5 Apr 1814, together with Louis XVIII. In 1819 Hobhouse served some time in Newgate Prison after he had gone too far in one of his writings. In 1820 he entered the House of Commons as a Radical and harassed the Tories whenever he could. Hobhouse investigated the Peterloo Massacre himself and was always critical of the way demonstrators where treated in those days. He was also a warm supporter for the cause of Greek independence. After the Reform Act of 1832 was passed he left the radicals and became a conservative Whig. Between 1831 and 1852 he served as Irish Secretary and several other important posts under Melbourne and Russel. In 1851 he was granted the title Lord Broughton de Gyfford and shortly afterwards he retired from politics. Writings: "Journey through Albania (1813)"; "Historical Illustrations of the Fourth Canto of Childe Harold" (1818); "Recollections of a Long Life (1865)". 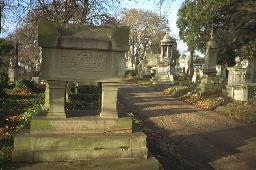 John Hobhouse's tomb at Kensal Green Cemetery, London.